THE ARTIST PROOF EDITION: US $520. Bound for Tokyo, Lieutenant Colonel Jimmy Doolittle launches his B-25 Mitchell from the heaving deck of the carrier USS Hornet on the morning of 18 April, 1942. Leading a sixteen-bomber force on their long distance one - way mission, the Doolittle Raiders completed the first strike at the heart of Imperial Japan since the infamous attack on Pearl Harbour four months earlier. Together, they completed one of the most audacious air raids in aviation history. 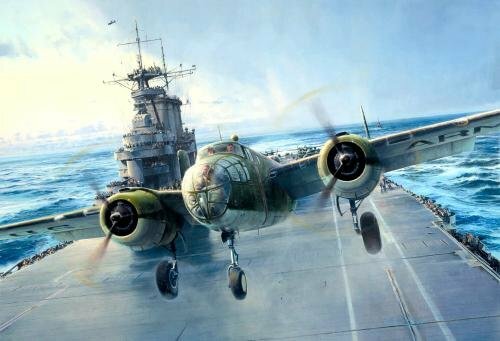 This is certainly one of the most dramatic paintings that Robert has produced and Joining him in individually signing each print in these editions are a number of the Doolittle Raiders. Every print is individually hand-numbered. THE LIMITED EDITION: $320 FIVE veterans who took part in the Doolittle raid. THE COMMEMORATIVE PROOFS:$675 Issued with a matching numbered, signed companion pencil print, a total of THIRTEEN signature Edition.